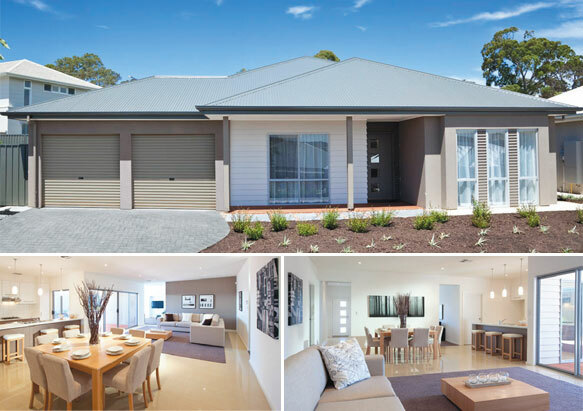 This innovative Gallery Living design offers style and space for the modern family. Step inside this stunning home and you will appreciate the critical interplay of design, style, function and lifestyle. Clever design was the focus of this home, creating large, comfortable spaces for adults and children to enjoy. The large alfresco entertaining area is located in the heart of the living area under the main roof, giving you a great entertaining space in any weather. The dining area looks on to a designer open-plan kitchen with a stylish island bench which enables this area to be part of all the activities of a busy family. This space is perfectly set up for the cook to offer snacks to those relaxing in any one of the four spacious living areas, one of which is a stunning home theatre room, a perfect retreat for teenagers or parents alike. This four bedroom home has a study (or 5th bedroom) and formal lounge, both located at the front of the home, ideal if you work from home and have clients visit. On the right of the entrance is the master bedroom with a large built-in wardrobe and an expansive ensuite. Gallery Living’s generous standard specifications make the ensuite a truly elegant space. Despite its extensive size, this home is ultra efficient and effective when it comes to the use of space and light. It has great architectural features, including a vaulted 3m high ceiling in the front entry area and many long windows that fill the home with optimal, natural light. A home perfect for family living.